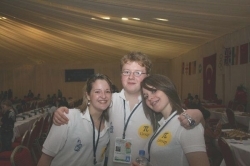 The second day of the 2007 World Youth Chess Championships has passed. Picteresque kids are enabling journalists to take curios shots of the kids. 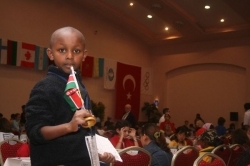 Chess and children should enhance anyone that sees the atmosphere in Kemer. You can see some stories at the link below together with a short summary of the major upsets on top boards of every team. 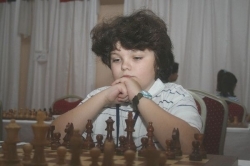 FM Ilya Nizhnik, definitely a future star of world chess (or is he already) as the latest edition of Ukrainian chess prodigies. 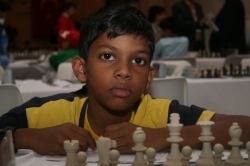 His debut in the international chess scene was not his former victories among cadets but his sensational win Moscow Open B with 8,5/9 and 2633 performance at the age of 10. 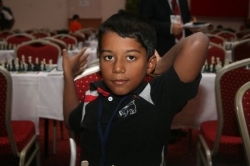 He won the European title in Under12 last month in Sibenik with the same score. He is the top seed o the Under 12 category but the most amazing thing about this kid is the way he behaves. His mimics, his gestures, and the way he wanders around the tournament hall reminds a former legendary name who is now trying to rise in Russian politics. And local heroes together before their daily work. Ayça Fatma Durmaz who also played in ECC last month and gold medalist in Turkish Championship Under 12 with Ye?im Patel, definitely a story on her own. Two Indian players. The Indian delegation is one of the largest ones in Kemer with 126 people. In U-18 group, the heavy guns GM Popov and GM Howell won their games as IM Warakowski and IM Hoyos. In U-18 the there were some upsets including WFM Gunina's loss against Preethi despite a rating gap more than 200, Rakic made a draw against Minina as Ignacz sisters with each other and WIM Y?ld?z with Kruljac. U-16 girls group was not short of big upsets since Guramishvili lost against Berize while Girya and local hero Öztürk drew against Rysbayeva. 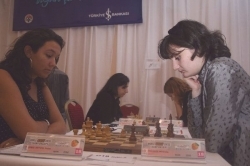 In U-16 group , the top rated players won their games except for Chirila and Fodor. 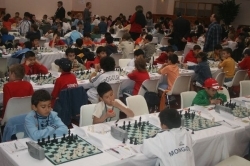 In U-14 General, Sjugirov won against Baghdasaryan while an upset in this group was Yee's win against FM Stukupin. There is not much upset in U-14 girls except for the fourth board draw between Lefevre and WFM Arabidze. 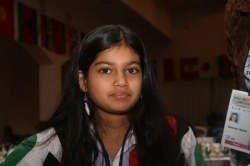 In U-12 girls group Osmanodja, the top seed of the event drew her game against Bahgeri from Iran. 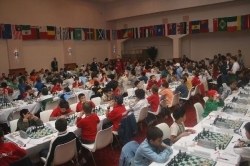 In U-12 group top seed of the event Ukranian FM Nyzhnyk won against Kaminski. 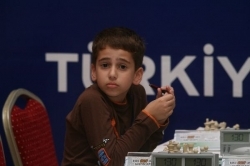 Atilla Yüksel who recently achieved CM title in the 78th FIDE Congress in Antalya drew against FM Sahaj Grover. 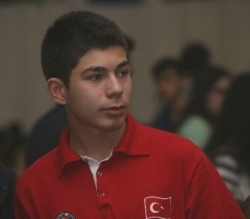 O?ulcan Kanmazalp, a talented youngster from ?zmir (one of the most active cities in Turkey, in the Aegean coast) who amassed 171 ratings in just one rating period, between July and October and achieved an IM norm in Alhusta, Ukraine this summer now rated 2264. He still has to work hard and play well to bring a medal to the home country since there are many strong youngsters like him in Under 16 group. WFM Fiona Steil-Antoni(2104) from Luxembourg who already visited Turkey last month for European Club Cup won against WIM Mikadze(2255). 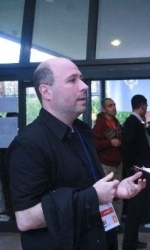 In the background there is the Turkish star WIM Betül Cemre Y?ld?z. 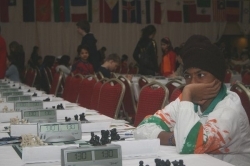 There are some already wondering about Vietnam, the next host of the World Youth Chess Championship in 2008.